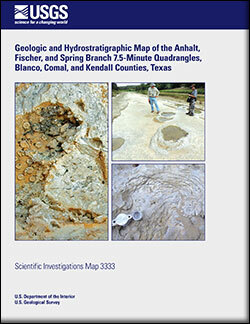 This report describes the geology and hydrostratigraphy of the Edwards and Trinity Groups in the Anhalt, Fischer, and Spring Branch 7.5-minute quadrangles, Blanco, Comal, and Kendall Counties, Texas. The hydrostratigraphy was defined based on variations in the amount and type of porosity of each lithostratigraphic unit, which varies depending on the unit’s original depositional environment, lithology, structural history, and diagenesis. Rocks exposed in the study area are of the Lower Cretaceous Trinity Group and lower part of the Kainer Formation of the Lower Cretaceous Edwards Group. The mapped outcrops in the study area are the Pearsall Formation and Glen Rose Limestone of the Trinity Group. The Pearsall Formation consists of, in ascending order: the Hammett Shale, Cow Creek Limestone, and Hensell Sand Member. The Glen Rose Limestone is composed of the informal lower and upper members. In the study area the Edwards Group consists only of the informal basal nodular member of the Kainer Formation. The faulting and fracturing in the study area are part of the Miocene-age Balcones fault zone, an extensional system of faults that generally trends southwest to northeast in south-central Texas. An igneous dike, containing aphanitic texture, cuts through part of the Anhalt quadrangle near the confluence of Honey Creek and the Guadalupe River. The dike penetrates the Cow Creek Limestone Member and the lower part of the Hensell Sand Member outcropping at three locations. The hydrostratigraphic units of the Edwards and Trinity aquifers have been mapped and described herein using a classification system developed by Choquette and Pray (1970), which is based on porosity types being fabric or not-fabric selective. The naming of hydrostratigraphic units is also based on preexisting names and topographic or historical features that occur in outcrop. The only hydrostratigraphic unit of the Edwards aquifer present in the study area is VIII hydrostratigraphic unit. The mapped hydrostratigraphic units of the upper Trinity aquifer are, from top to bottom: the cavernous, Camp Bullis, upper evaporite, fossiliferous, and lower evaporite and they are interval equivalent to the upper member of the Glen Rose Limestone. The middle Trinity aquifer (interval equivalent to the lower member of the Glen Rose Limestone) contains, from top to bottom: the Bulverde, Little Blanco, Twin Sisters, Doeppenschmidt, Rust, and Honey Creek hydrostratigraphic units. The lower part of the middle Trinity aquifer is formed by the Hensell, Cow Creek, and Hammett hydrostratigraphic units which are interval equivalent to the Hensell Sand Member, the Cow Creek Limestone, and the Hammett Shale Member, respectively, of the Pearsall Formation. Clark, A.K., and Morris, R.R., 2015, Geologic and hydrostratigraphic map of the Anhalt, Fischer, and Spring Branch 7.5-minute quadrangles, Blanco, Comal, and Kendall Counties, Texas: U.S. Geological Survey Scientific Investigations Map 3333, 13 p., 1 sheet, scale 1:50,000, https://dx.doi.org/10.3133/sim3333.